Senate President Bukola Saraki has been invited by the Nigeria Police force in connection with the bank robbery, which recently occurred, in Offa, Kwara State. This was after he was indicted by five of the suspects who confessed to the crime. The Force Spokesperson, Jimoh Moshood, in a statement on Sunday, said the bank robbery led to the death of 33 persons including some pregnant women and nice police officers. Also according to the police, the five gang leaders further confessed that they are political thugs under the name Youth Liberation Movement a.k.a “Good Boys” and were sponsored with firearms, money and operational vehicles by the Senate President Saraki and Governor Ahmed. The police said other suspects were arrested after the arrest of two principal suspects. The police added that a Lexus jeep GX-300 (Ash Colour) with a sticker number plate with inscription “SARAKI” “Kwara, State of Harmony” was used by the gang leader during the bank robbery. 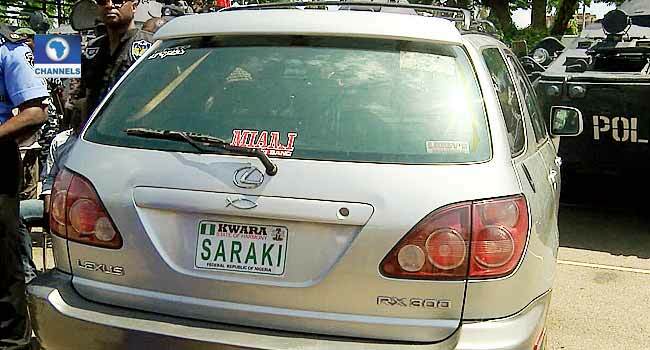 Moshood in the statement revealed that the sticker number plate with inscription “SARAKI” “Kwara, State of Harmony,” was however removed and another plate number (Reg. No. Kwara, KMA 143 RM) registered in the name of Ayoade AKinnibosun the alleged overall commander of the Offa bank robbery was then attached to the vehicle to cover up the identity of the said vehicle. The police said the vehicle was eventually recovered from the premises of the Ministry of Environmental and Forestry in Ilorin, Kwara State while the sticker number plate with inscription “SARAKI” “Kwara, State of Harmony” removed from the vehicle was recovered from one Adeola Omiyale who drove the Lexus Jeep to Government House in Ilorin, immediately after the bank robbery. The Senate President on Wednesday, May 16, said the Kwara State Governor, informed him that a group of suspects who had been in police cells for several weeks for cultism and whose investigation had been concluded with the prosecution about to commence under the state law had been ordered to be transferred to Abuja. The police in reaction dismissed Saraki’s allegation noting that it is misleading and was an attempt to obstruct justice and the police investigation.